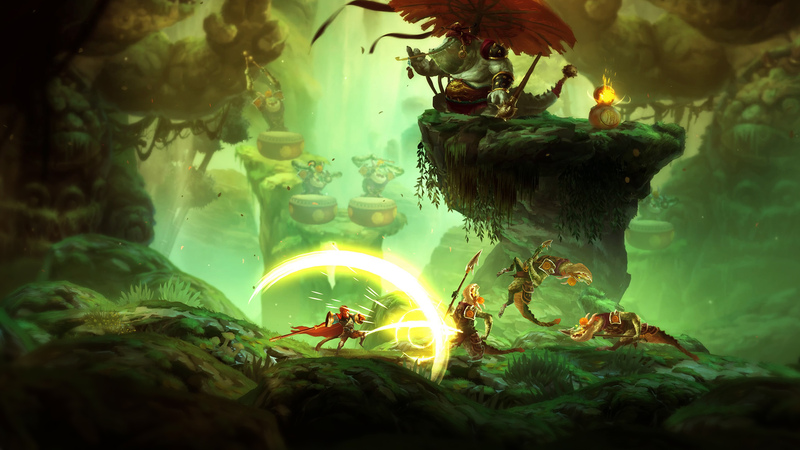 Unruly Heroes’ visuals are truly stunning, but the platforming, combat, and story lack any real depth. I wanted to like Unruly Heroes; I really did. I love the art style, the character sprites, the animations – basically, the whole visual side of the game looks pretty darn impressive. Sadly, everything else never measures up to the same quality. Platforming is too slow and boring, combat is repetitive, and the voice acting ranges from passable to irritating. Some creative ideas and fun gimmicks get lost in the tedium that is playing through levels that don’t feel significantly different from one another. Unruly Heroes is a co-op brawler platformer with some light puzzles sprinkled in. It’s based on Journey to the West, the Chinese tale about the adventures of the monkey king. It is a sort of retelling of that story, but more through the levels, characters and gameplay than an actual plot. That’s because Unruly Heroes is really all about the gameplay. I mean, there’s an exposition-dumping cutscene at the beginning of the game, and some character dialog between certain levels, but it all feels more like a backdrop for the jumping and the punching. Which would obviously be fine if the jumping and the punching weren’t so… dull. 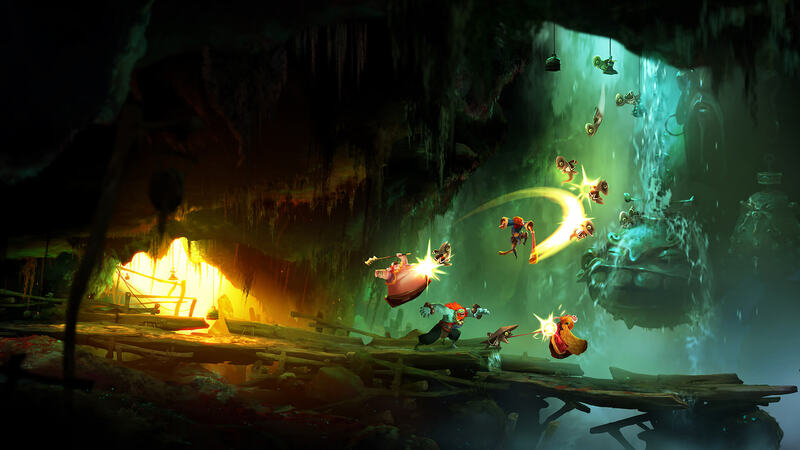 Initially, I was expecting Unruly Heroes to be a hybrid between Rayman Legends and perhaps Trine – chaotic multiplayer fun with some clever puzzles. However, the game is neither chaotic nor clever. In fact, it’s mostly annoying, bordering on the frustrating, with some serious pacing issues. The game never picks up speed, and the platforming is more about precision and lacks any sense of rhythm. There’s simply no flow to the levels, and they end up dragging to the point when they lose all novelty. The developers do take advantage of this slow pace and hide coins and collectibles in secret nooks along the way, which would be hard to spot in a more fast-paced game. But that only slows down Unruly Heroes even further, as you constantly stop to try and look for hidden areas. The puzzles don’t help either. They are mostly of the “don’t jump on the spikes” variety, with a couple of more imaginative setpieces per levels that mix platforming, combat, and lever-pulling in a satisfying way. There are occasional puzzles that utilize a specific character’s special ability, though calling them puzzles is to stretch the definition of the word. They are more like roadblocks that “force” you to use a character to move on, and don’t really require any skill. Speaking of which, it’s time to introduce the characters you can play as. According to the game’s site, they are “Wukong the Monkey King, Sanzang the Sleepy Monk, Kihong the Greedy Pig, Sandmonk the Sensitive Brute.” Again, this is only according to the site, because Unruly Heroes never bothers to tell you who these characters are and what’s their connection. All four of them play a little differently: two can double-jump while the other two can glide, Sandmonk is stronger but has a very limited range, with Sanzang’s attacks do less damage but can target multiple enemies. After playing around with each warrior, I found they don’t feel very balanced. I don’t know if it’s because of my “just hit the attack buttons and watch how everything gets obliterated” fighting style, but Kihong quickly became my character of choice. His attacks have a good range and are useful against single strong enemies or a group of smaller ones. In general, he feels more useful, both in platforming and combat. The others are just sluggish or weak in comparison. Combat, in general, is pretty fun at first, but quickly becomes mechanical and repetitive. You can dodge, use two or three types of attacks, and there’s even a combo system that rewards you for being quick and versatile. Once you learn how to perform every attack at the right time, you can breeze through most encounters – even boss fights. The lack of challenge means that combat becomes a nuisance that slows you down instead of an exciting part of the level. You just want to “get it over with” so you can move on ahead. When you’re playing with friends, combat does go by faster, simply because more punches are being thrown around. It doesn’t make fighting any better but does give you the opportunity to goof around and try different moves while your companions keep the enemies busy. If you tire of punching lizards and other animals, you can try and punch your friends in competitive multiplayer. It is a separate mode that puts fours players in a small arena and lets them hit each other until only one is left standing. You can collect random bonuses that make you stronger or faster, but you won’t find real depth here – it’s a mode that exists, and there’s no real reason to play it when you have the rest of the game. Unruly Heroes is a pretty game; I’ll grant you that. It’s nice to look at, the characters and enemies are all distinct from each other, and it’s clear a lot of work has been put into making the visuals as attractive as possible. Sadly, that’s all the game has to offer. For some, it might be enough, but I expect a little depth from the platforming, combat or story. I didn’t enjoy slogging through the campaign, either alone or with friends. 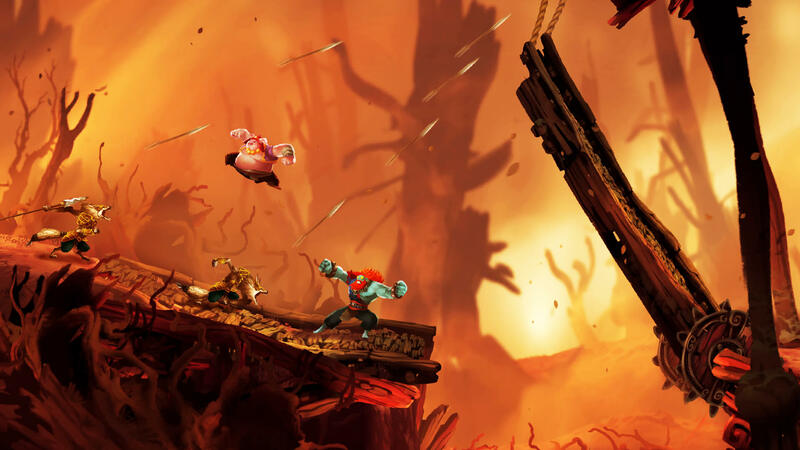 If you’re really into cartoony platformers and are just looking for something to play with your buddies – sure, Unruly Heroes could be that game. But I wouldn’t rule out looking for another game to play first.